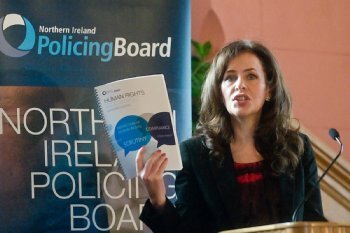 She was speaking at the launch of thePolicing Board of Northern Ireland’s 7thHuman Rights Annual Report, which was held at the campus. It was the first time that the Board had launched the report, on Friday (Feb 3), at a venue outside Belfast and the historic venue was full to capacity with representatives of voluntary organisations, community and lobby groups, political parties, teenage students and human rights researchers. PSNI Chief Constable Matt Baggot was among a panel, which was chaired by Conall McDevitt MLA, Chair of the Policing Board’s Human Rights and Professional Standards (HRPS) Committee, who answered questions from the floor during the lively and challenging two-hour event, which was streamed live online. The other panellists were Ryan Feeney, Board Member and Vice Chair of the HRPS Committee; Debbie Watters, Board Member and Member of the HRPS Committee; Alyson Kilpatrick, the Board’s Human Rights Advisor;Linda Watson, local community representative; Noel McCartney, local community representative. Professor Heenan pointed to the optimism behind 2013 UK City of Culture and the successful bid for the All-Ireland Fleadh as examples of what could be achieved by “collective endeavour”. Professor Heenan added:“Human rights studies and research are a long-standing and vital part of our wide-ranging provision and academic activity at Magee and so it is particularly fitting that the Policing Board’s Human Rights Annual Report is being launched here. “INCORE (the International Institute for Conflict Research) and the Transitional Justice Institute, both of which are in the Faculty of Social Sciences, teach innovative human rights programmes and conduct research into human rights practice and law which is valued by scholars around the world. Board Chair Brian Rea said the Board was delighted to launch the Report at Magee.“It is an opportunity not only to highlight the findings of the report but also to encourage debate on policing and human rights issues amongst the panel, audience and online users. “A key concern for the HRPS Committee is paramilitary style assaults and shootings and the low clearance rate (4%) of this serious crime. Figures from the report show that between 1 April 2010 and 30 September 2011 44% of these attacks have been against 16 – 24 year olds. The Board is recommending that the PSNI should consider what further measures are required to protect people from such attacks, and that PSNI should develop a strategy for addressing attacks on children and young people, who are particularly vulnerable. For further information, please contact the Northern Ireland Policing Board's Press and Public Relations Office on 028 9040 8565 / 07801738795.